Ashton Lane, the husband-and-wife duo named after a cobbled Glasgow street where they met, play at Tuppenny Barn, Southbourne, this Saturday (March 17) as part of a three-month tour to lead them into what will be a hectic festival season. Claire Falla, Music@theBarn promoter at Tuppenny Barn, said: “Esther and Tim O’Connor are part of a new wave of homegrown modern country music but they have built their reputation by touring the length and breadth of the UK, Europe and the USA. “The duo first came to her attention when they played the Hard Rock stage at the 2017 Isle of Wight Festival. Esther and Tim received an enthusiastic reception on the island, and it took a while to tie them down to a date on the south coast because of their increasing popularity on the European live circuit. “As well as their spring tour schedule they are also writing and recording a new album due for release in September 2018 and we are looking forward to hearing some of the new songs. “Last October Ashton Lane had a number-one single success on the iTunes country chart with Breathe You In. 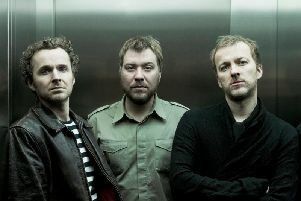 Their album Winter Star also featured in the album chart to provide a sign of the exciting things to come from this talented Scottish outfit. “The duo are also extremely active in engaging with their followers on social media,” added Claire. “They continue to preview songs from their forthcoming album via the hugely-popular kitchen sessions where Esther and Tim perform their songs live on YouTube. “They also keep their fans up to date on the writing and recording progress of the new album via their own exclusive direct-to-fan App created by Gigrev. Tickets at £14 are available from http://www.tuppennybarn.co.uk/musicthebarn or at Harbour Records, Emsworth.